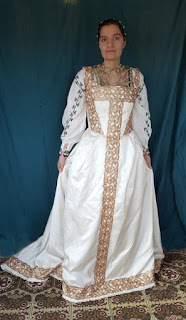 Eva's historical costuming blog: Finally some photos! It has been finished for a month, but either she has been ill, ow had exams, or I have been working or otherwise busy. But this very busy weekend, which included celebrating Imbolc on Friday, annual general meeting for Gotvik and celebrating my husband's birthday on Friday and celebrating my youngest niece's birthday today, we finally managed to get photos taken. Writing the documetnation will take a few more days, but for now I give you two photos of Valeria in her Eleonora di Toledo gown. The fabric - guess what I'm going to make? Details of the construction of the skirt.